Today’s article is a guest contribution by Aimee Millwood. Facebook ads provide enormous potential to grow traffic and sales. But knowing how to create ads that get results isn’t easy. Many businesses fail to grow traffic on social because they don’t know how to create ads that grab attention. Here’s the bottom line: To sell on social media, you must use social proof, and it has to be the right social proof. We ran A/B tests to compare how Facebook ads with customer content performed against ads with only brand content. We saw that cost per acquisition dropped significantly, while conversion rate and average order value shot up. For one thing, selling on social has traditionally been difficult for many brands. Social is a place where people go to connect with their friends and networks, not to look for things to buy. As Gilt’s Susan Lyne put it, trying to sell on social is like trying to sell at a bar. She may have a point, but done correctly, selling on social is possible. You’ve just got to join in the conversation rather than interrupt it. By integrating content created by customers (and Facebook friends), people see a recommendation from a person they trust, not an ad thrown at them by a brand. 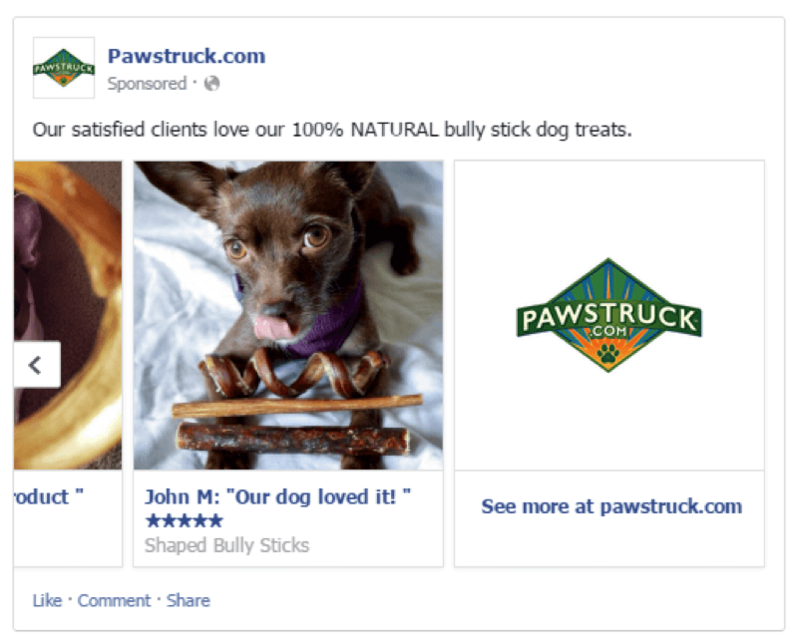 These results are great, but they don’t mean you should run off to Facebook and start putting your customers’ UGC on ads. It’s not enough to simply plaster a customer-submitted Instagram photo or product review on an ad. You need to know how to integrate customer content intelligently in order to tap into its potential. 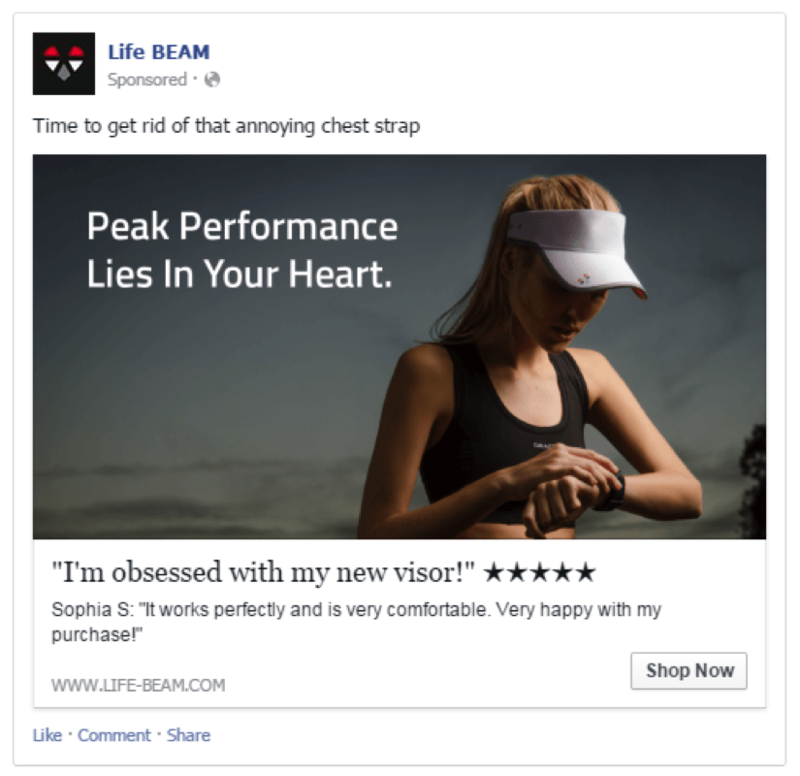 We’re here to teach you what the data showed us about how to drive the best results from Facebook ads. 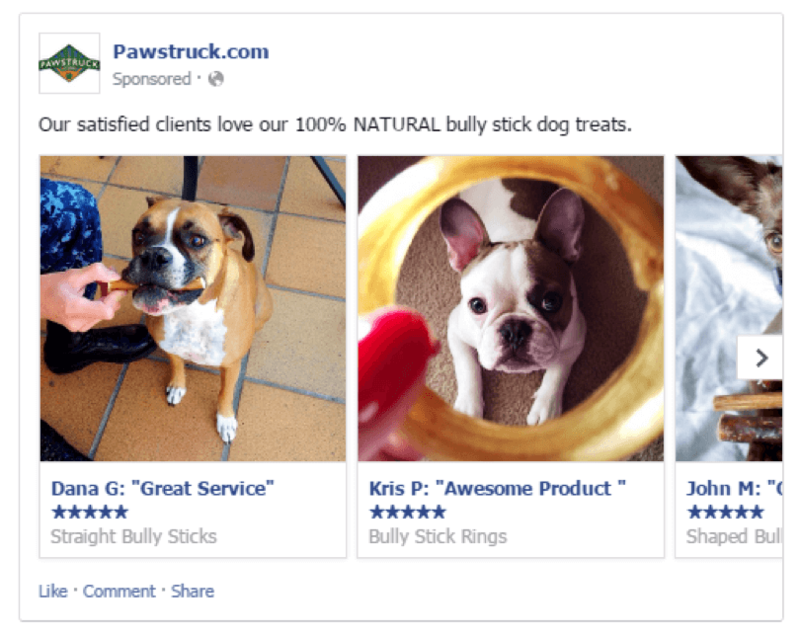 We sat down with our Director of Advertising and took a look at insights gained from testing thousands of customer-content Facebook ads. Here are our conclusions along with insider tips on how to get the best results from Facebook ads. 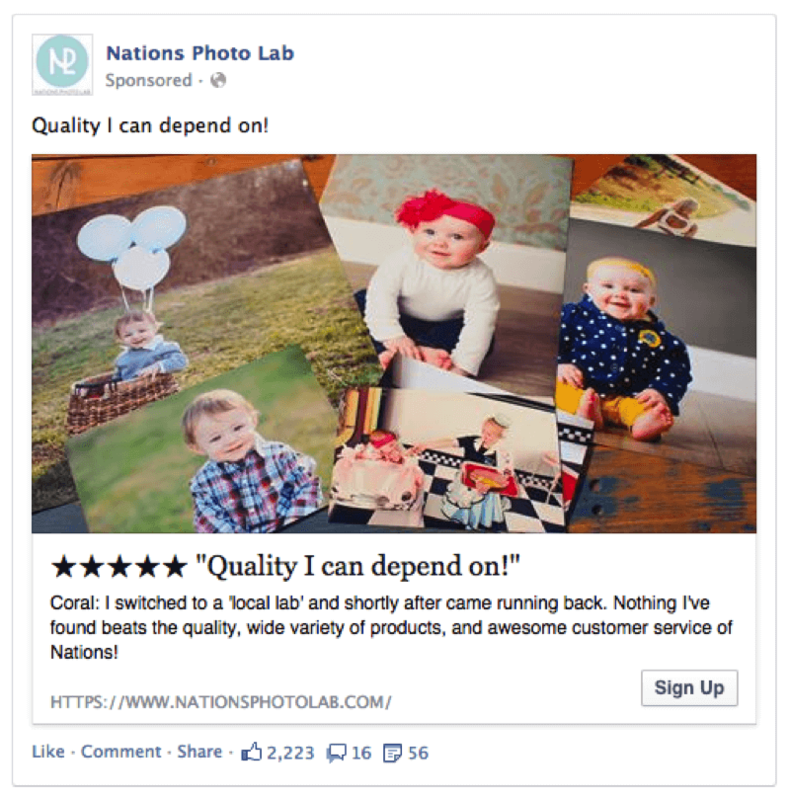 These tips and statistics deal specifically with using reviews in Facebook ads, but the advice applies regardless of what type of UGC you’re using. Keep it short. Shorter ad copy performs better. Though it may seem counter-intuitive, don’t use the word “reviews”! It comes across as too salesy. Ads with the word “reviews” in the copy don’t perform as well. Make sure the voice in the copy matches your brand voice and message, not the customer’s. The review is where you let the customer speak. The top of the ad should stay on brand. For example, in the ad below, notice how the ad copy is short and to the point, in the same tone as the review itself. Also, the copy is concise but comprehensive, making it easy for people to understand the message instantly. However, the following ad copy refers to the review; and because of this, it comes across as too salesy and forced. Additionally, the tone is much more formal than the review, so it doesn’t work as well. Also, it’s too long, so it doesn’t have the same impact that short, snappy ad copy does. In social advertising, it’s vital to target the right person with the right message at the right time. 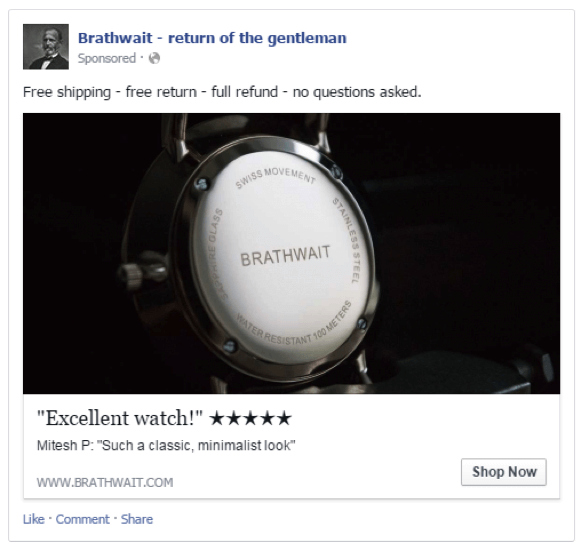 When it comes to Facebook ads, this means you should use a specific kind of review, depending on whether people are familiar with your store or they are first-time visitors. When you’re trying to gain clicks and traffic, it’s better to use product reviews. Use reviews of top-rated, top-selling products to attract first-time visitors with specific items. Why? Top-rated, top-selling products will attract new visitors, but after they visit the site and don’t buy the product, it’s more effective to re-target them with site reviews. Site reviews emphasize the authenticity and strength of the brand, not a specific product, so the reviews will reinforce your brand even if the visitors don’t want to buy the specific product. You might be proud of a review that says “Great shipping and excellent service,” but that doesn’t mean it makes good copy for an ad. Especially on social media, people want to read about real experiences. Using personal pronouns is a psychological cue that the stories are authentic. Because of this, reviews that have words like “I,” “my,” or “we” are much more effective than reviews that don’t refer to personal experiences. The beauty of using UGC as ad creative is that it is genuine and credible content from real people. However, when the copy is too enthusiastic, even if it is real, it looks fake to the reader. Even though the overexcited review looks good to you, it is less trustworthy, which is why ads using reviews with “!! !” are less effective. So, keep your reviews to one exclamation point maximum. Look at the difference in the two ads below. While subtle, including too much enthusiasm doesn’t seem as trustworthy. It’s better to use a review in which someone talks about using the product than one in which they describe the fast shipping. Once again, it comes back to people wanting to relate to a real and personal experience. 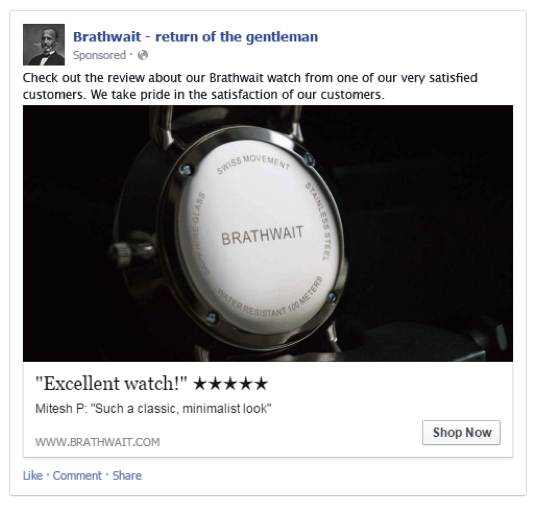 In the example below, the carousel displays reviews with generic praise about the product and service. In contrast, the following carousel contains specific examples of personal experiences, making it much more effective and relatable. Try not to put money into anything you haven’t tested organically first. The beauty of Facebook is that you have a lab where you can test content, albeit on a smaller scale than with an ad. Test different copy, images, and audiences to see what resonates before you pull out your money. In summary, the customer’s voice is your most powerful marketing tool. 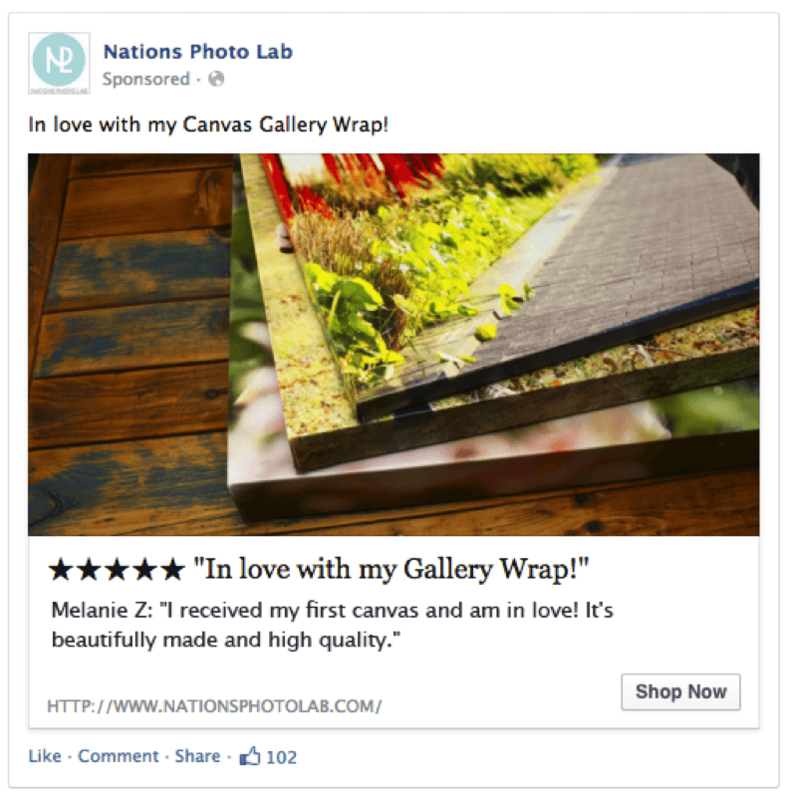 Use it to your advantage by integrating customer content in your Facebook ads. These tips can help you get the best results from this effective strategy. About the Author: Aimee Millwood (@aimeemillwood) manages the Yotpo blog, where she writes about marketing, growth, and engagement.